Experience stress-reduction like you've never felt, connect with your higher consciousness, allow your body to go back into vibrational alignment, heal at a cellular level. Many are benefiting from the tranquility of sound healing. When will you? DESCRIPTION ​Join us for stress-relieving singing bowl & Reiki meditations! Meet like-minded people as we cultivate a community of compassionate people trying to service our overly reactionary world. Every class is grounded in mindfulness to promote peace within and around Madison. OUR PROCESS Once you arrive, you'll be greeted into the space and be shown where to settle in. Essential oils and crystals are offered for people who would like to use them for centering, clearing any energy blocks or opening of the chakras. When our class begins, we get right into it. A certified yoga teacher will lead the group in a grounding meditation and our team will begin to play our set of singing bowls (7 different tones) that resonate and help balance our 7 main chakras for about 40 minutes. During the soothing music, Reiki Master Krista Pfohl of Luna Frequency will step away from playing and walk around to individuals, offering Reiki (Healing Life Force Energy). HOW IT WORKS At a cellular level, we are 75% water. As the vibrations of the crystal and Tibetan singing bowls pass over our body (which is why it is also known as a sound bath), our brainwaves go from Beta to Theta, and sometimes, if we go deep enough, to Delta. Our normal waking consciousness corresponds to the Beta state, which is our brain emitting waves between 13-30Hertz. The feeling of relaxation and concentration is linked to the Alpha state, which sends waves between 8-13Hertz. Then we go into Theta state (5-7Hertz), which is associated with Rapid Eye Movement and the release of muscular spasms and energetic blockages. Delta state (0.5-4Hertz) can also be achieved through prolonged playing of the singing bowls, emitting extremely low vibrations associated with deep sleep and other unconscious states. In just 40 minutes, our bodies go through these different brain states leaving our clients feeling more relaxed, in less pain, and fully rejuvenated. People leave saying they were able to release aches and pains, others say they felt like they went to a different world. Whatever their experience, people are leaving in a better state of being, ready to spread compassion to those around them. Reserve your space below! ​Reiki, Massage, Pranayama & more. Email Niomi today! We are a group of total goofballs that find pure joy and alignment in working together to provide sound healing for Dane County. While you'll often find us laughing through the fun, we take our work seriously. We believe in the power of sound, its ability to heal on a cellular level, and the space it creates for spiritual growth. We intuitively play together, blending over 10 different tones of clear quartz crystal in the form of singing bowls, pyramids and a merkabah. 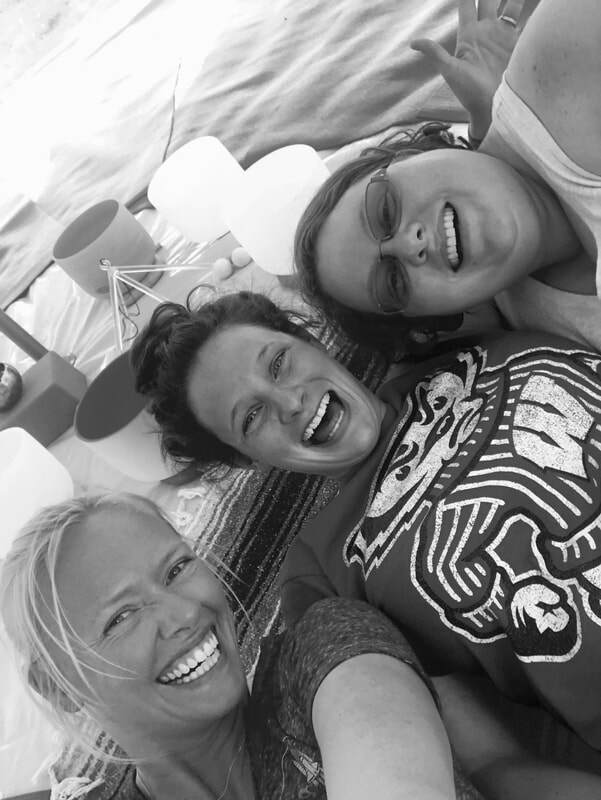 The three of us regularly put on wellness events in and around Madison WI in the forms of sound healing meditation classes, 3 hour workshops called Hike, Heal & Hum, pop-up day retreats and overnight retreats. In our longer programs (3 hours or more), we combine forest therapy, hatha yoga, sound healing and Reiki to create space for deep healing and personal growth. You can register for events here on hikeandheal.com below. To schedule individual yoga classes, please contact Niomi, and for Reiki, contact Krista. They rock! Online pre-registration is required so we can anticipate numbers. Register below. Do you know the benefits of sound healing? Prolonged vibrational healing through sound encourages a deep relaxation response, stimulating the production of theta & delta brainwaves to take you to that often desired but hard to achieve meditative state. It impacts changes in our physiological body, which positively impacts mood. It improves mental clarity and brain functioning. Music Therapy reduces the body's stress hormones, rejuvenates the mind and body, supports immune health, brings our nervous system into balance, reduces pain, integrates left and right brain patterns, strengthens mindfulness practices, builds community, and inspires creativity that improves one's overall well-being! ​How's that for a list? Interested in setting up a time for a private group? This is a great way to introduce wellness to business teams, families, friend groups or otherwise. Sound healing meditation is a completely unique experience! Pair it with a 1-2 hour leadership development workshop for your corporate or non-profit group. Pricing is based on the number of people and duration. Contact us today!